TRC offers a distinct grassroots model of Restorative Justice. The Restorative Center (TRC) seeks a viable alternative to the adversarial system, a better way to resolve and deter conflict, to promote individual and community healing, and to reclaim justice. In fact, TRC is insistent that the ideals of Restorative Justice must not be co-opted by the criminal justice system but reside best in the power of individuals and communities. We envision a future in which the majority of issues–that are currently routed through the criminal justice system and family court–are resolved by the communities where those issues arise. TRC’s program team studied a range of circle practices used in the United States, Jamaica, South Africa, and Brazil, and pulled elements from each to form the basis for our model, also employing our team’s expertise in systems theory, psychology, social work, mediation, law, curriculum development, narrative medicine, childbirth/parenting education, and yoga/meditation to inform the model’s structure. Thus the Newburgh Model of Community Circles was born and named in honor the city which hosted its development and implementation. Where is TRC hosting circles? The Restorative Center has on-going Circles throughout the State of New York–Community Circles in Newburgh, Nyack, Teen Circles in the Bronx and a pilot program with incarcerated populations. In the coming months we will be using circles for family conferences, conflict resolution, post conviction reintegration and circles with law enforcement and Teens. especially ones you never hear from." "I felt challenged less as an individual and more as member of the group, which is to say the circle became a space for practicing sitting with/holding space for the various feelings, complications that come up in a human community." We listen to the wisdom of our communities to guide us to the best place & use the powerful process of sitting in circle with each other. Healing rifts through storytelling. Participants use the power of storytelling to find common themes in their lives to develop empathy and explore vulnerability. Nurturing bonds by welcoming our newest member. After the birth of the baby, a community circle is formed with the father, grandparents, law enforcement, education providers, and other relevant community members. 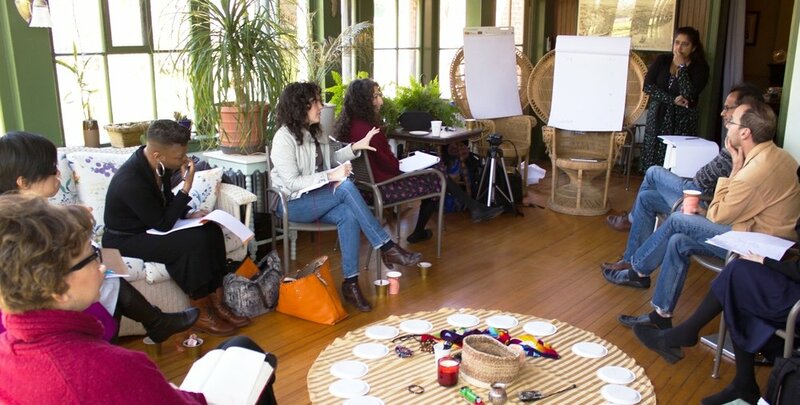 Each member of the Birth Circle acknowledges their own personal sense of responsibility for the well-being and nurturing of the new baby as a community member. Circles will be held at each milestone to provide postpartum support for the mother. Unwinding conflict without courts. If the Criminal Justice system is the problem then Circles are the solutions. Circles bring together the people in conflict (crime is a manifestation of conflict) as well as the family and the community members vested in the process of community redress. RJ Circles coalesce community attention on behavior that may be deemed "criminal" in another forum. In a facilitated RJ circle by TRC, community members and parties with a claim of harmful or offending behavior listen to each other. The community and participants are able to speak of the effect of "offending" behavior and are given a forum to express any authentic response. With all parties present, a plan of recourse can be formulated, and an agreement can be made on how to move forward. The circle process acknowledges that we are all harmed and we have all harmed, so the labels of the criminal justice system are not best suited outside its purview. However, until we form a new independent viable system to respond to issues of justice within our own communities, some vocabulary of the parallel system may seep in. There is urgency to action as the current model is unsustainable. In a re-integration circle, members are welcomed back into the community after a period of incarceration. “I can't believe how we opened up with each other." The Restorative Center was founded by Shailly Agnihotri in response to the profound heartbreak she experienced as a public defender trying to attain justice for her clients. TRC program development is a direct answer to the consequences of the privatization of prisons, the institutionalism of racism, and the criminalization of poverty.